Working for yourself has a ton of benefits – a flexible schedule, the opportunity to pursue projects you love, and the ability to work in your pajamas. While being self-employed can be truly rewarding, it can also be something of a headache come tax time. Between regular income taxes and self-employment taxes, Uncle Sam isn’t exactly helping pad your wallet. Still, taxes are a necessary evil, so we’ve created this handy guide to help minimize your stress this tax season. Use separate bank accounts and credit cards for business and personal payments and expenses. Especially if you use your personal accounts for business transactions, keep close track of what you earn and spend within your business to ensure you have the documentation you need if you are audited. If you think you’ll owe $1,000 or more in taxes this year, then you’ll most likely need to make quarterly ‘estimated’ tax payments. You can determine your estimated taxes using Form 1040-ES. You’ll need to complete a new 1040-ES each quarter if your earnings are different than your estimate for the previous quarter. The IRS has specific deadlines for each quarterly payment, so make sure you’re paying on time. If you miss a quarterly payment or neglect to pay at all until the end of the year, the IRS may charge fees and interest on late payments. If you over-estimate and your quarterly payments end up being too high, then you’ll still be able to collect a return at the end of the year, just like regular employees. Self-employed people often work for multiple clients, meaning you may need to collect multiple documents before you file your annual return. 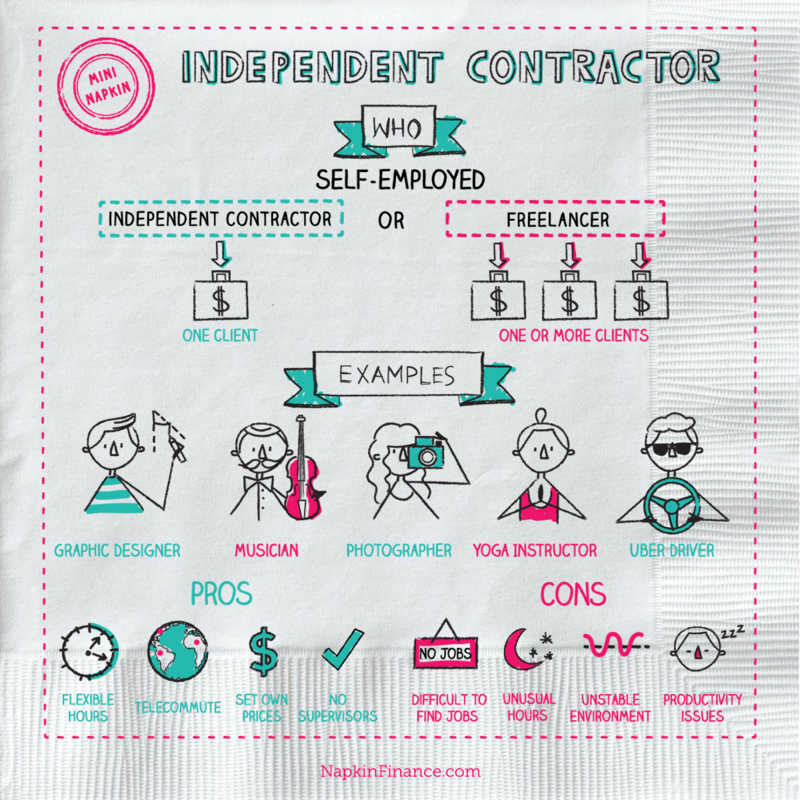 As an independent contractor, you should receive a Form 1099-MISC from any client that has paid you $600 or more throughout the year. However, if you receive payment electronically – such as via PayPal or other third-party payment processors – then the responsibility for issuing a Form 1099 lies with that online service. Third-party payment processors report income to you and the IRS via Form 1099-K. Your clients are required to file 1099 forms by January 31, so you should receive documentation of your reportable income by early February. If not, contact your clients and ask for it. Even if you don’t receive any documents from your clients, you still have to report your income to the IRS. One of the worst parts about doing your taxes is that self-employed individuals often have to pay more than traditional employees. Avoid potential surprises by educating yourself on the types of taxes you’ll face. Like everyone else, you pay income taxes on any amount you earn throughout the year, according to the marginal tax rate that applies to your income level. Because you don’t have an employer to pay partial Social Security and Medicare taxes on your behalf, you are responsible for the entire contribution. This is what is referred to as Self-Employment taxes. If you earn more than $200,000 (or $250,000 if married filing jointly), you will also owe an Additional Medicare Tax of 0.9% regardless of how you are employed. Form 1040 – As always, you need to complete the Personal Income Tax return. But you’ll need to complete the Long Form version (not the 1040-A or 1040-EZ) because you have to include business income. Schedule SE – This is document is attached to Form 1040 and will help you determine the amount of Self-Employment tax you owe. The best way to reduce the amount of income tax you owe is to deduct business expenses, which you report on Schedule C. You should be prepared to back up the validity of these deductions in case of an audit, however. Remember, any expense for something you use for both business and personal reasons can only be partially deducted.